It is a strange coincidence that it is in the same year, 2011, that both Lucy O’Donnell (author of “Cancer is my teacher”) who drove me to start Chemo Headwear & Anikka Burton (founder of Not Another Bunch Of Flowers) were diagnosed with breast cancer. I read about Anikka in The Times and thought what an amazing woman she sounded & what a great company she had started. Anikka was diagnosed with an aggressive, locally advanced primary breast cancer at the age of 33 and had the full works of chemotherapy, targeted therapy, radiotherapy, hormonal therapy and 5 operations to date. She wrote a blog to help others through treatment: www.chemoforbeginners.com. “When I was first diagnosed, my wonderful and caring friends, family and colleagues sent me so many bunches of flowers that I ran out of vases, jugs, pint glasses… until I was putting them in saucepans and anything else that would hold water! Knowing that so many people were rooting for me was incredible – it gave me a much-needed boost on the days I was struggling – but, while flowers are bright and beautiful amongst the gloom of illness, there are only so many a girl needs!” It was this that inspired her to set up a website that others could buy useful, thoughtful gifts for loved ones & friends. She had really appreciated more practical gifts, as she didn’t want to be dashing around buying things like eye masks, button front pyjamas appropriate for surgery or headwear whilst having to attend endless medical appointments. “The gifts I’ve chosen are really, really lovely – so while they’re ideal for someone going through the kind of treatment I had to endure (and some are specifically for those going through chemo), almost all of them are just as special for people in different circumstances” says Anikka as she really knows what might be lovely to receive as a gift. 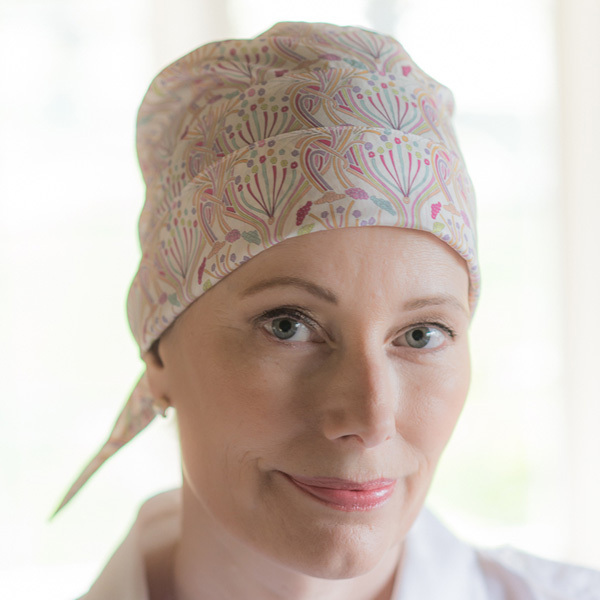 I set about contacting Anikka and I told her my story about why I had started Chemo Headwear as I felt there was a gaping hole in the market for luxurious, hand made, easy to put on headwear that was both practical & stylish in beautiful fabrics. Anikka agreed & has bought 4 Liberty print styles of my ready-tied Alice headscarf to sell on Not Another Bunch Of Flowers which I am thrilled about. I’m also really thrilled to announce having been told she wouldn’t be able to have children due to her cancer treatment that she has just given birth to a little boy called Monty. Congratulations!